Kyoto abounds with wonderful textile traditions that have been skillfully blended to create treasures like the 19th century kimono shown above, where the subtle use of dyes have created a wispy cloud-like texture as the background for this fabulous embroidered garden. In its day, such a kimono was probably worn by a lady-in-waiting of the imperial court, but is now the property of Kyoto National Museum. 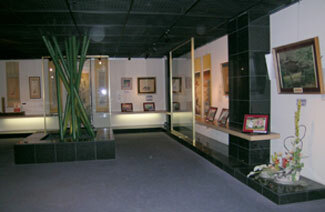 Smaller exhibitions of embroidery shown at Shishu-Yakata, The Embroidery Museum and School of Kyoto include both modern and historical pieces. 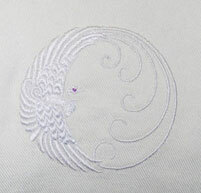 A 40-minute course in Japanese-style hand embroidery is offered at a nominal fee. The museum school also offer classes in making a Japanese pastry called Yatsuhachi-an, a fresh rice flour dough filled with sweetened bean paste. 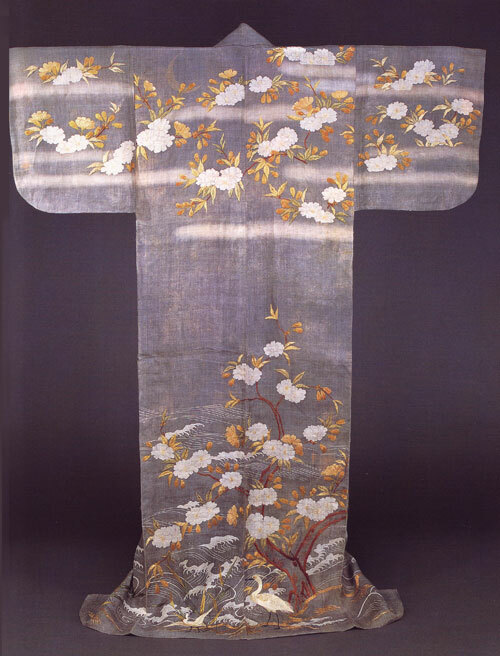 The classical Japanese embroidery used to decorate kimono worn by members of the imperial court was adapted from techniques that spread from China and Korea some 12 to 13 hundred years ago and requires the mastery of approximately 46 different stitches or stitch combinations. These elegant embroideries are generally stitched with a fine silk filament on silk or a fine linen-like ramie and featuring birds, flowers or scenes from poetry or classical literature. Of course, there are also many other wonderful Japanese embroidery traditions such as sashiko and kogen that were used by farmers and fisherman to repair, reinforce or pad their clothing. These clothes were often made of coarse indigo-dyed hemp fabrics and stitched with a sturdy white thread, creating a special rustic beauty all their own. But I’ll save a discussion of that for another post. This entry was posted in Japanese fabrics, kimono, Kyoto living on April 13, 2008 by admin. Cherry blossom time is such a special season in Japan, I’m glad to have gotten home in time to enjoy it. The trees in the park near my home, and indeed all over the city, seem to suddenly burst with blooms and everywhere there are picnics with happy people enjoying the advent of spring. It is good to be home after my travels.And where, you might ask, have I been? Where else but the American Embroidery Conference in Atlanta, Georgia, of course. After a year of anticipation and months of preparation, I spent last week seeing old friends and making new ones at the annual AEC. And what a conference it was, with tons of opportunities to learn from each other and from the marvelous line up of teachers organized by Dianne Pomeroy, the AEC conference coordinator.I studied Embird Studio with Amy Webster, multi-hooping with Jeannie Miller, problem solving with Terri Hanson, embroidered a shawl under the guidance of Santi from Hatched in Africa, and was inspired to achieve greater heights of style by Bobbi Bullard and Sue Lord. 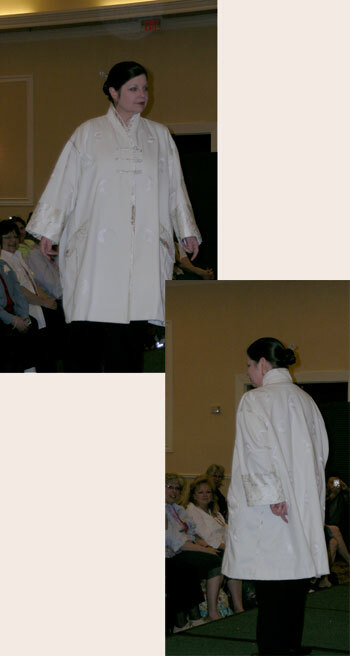 At left, is my own little fashion show entry — a denim kimono. Made with white denim trimmed with a printed polyester, it features multiple repeats of a snowy egret motif that I digitized myself and was gratified that my effort received lots of nice attention from my fellow conference partcipants. 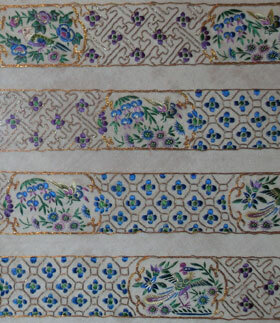 Since white on white embroidery can be a bit hard to see from the runway, a closer view of the motif is shown at right below. And now that the conference is over, it’s already time to start anticipating next year! Since Dianne makes a habit of out-doing herself each year, who knows what amazing classes will be in store for us in 2009. And in the meantime, I’ll take everything I’ve learned and every bit of inspiration I’ve gained from the 2008 conference and see how far I can go during the year to come. This entry was posted in digitizing, kimono, Kyoto living on April 2, 2008 by admin.